Officials said the government was planning urgent maintenance work in the area and the bridge closed on Friday, with a re-opening time to be announced. But the US CNN network said a spokesman told them the bridge, spanning a canyon, was "overwhelmed by the volume of visitors". He said there had been no accidents and the bridge was not cracked or broken. The 430m-long bridge, which cost $3.4m (£2.6m) to build, connects two mountain cliffs in Zhangjiajie, Hunan province. 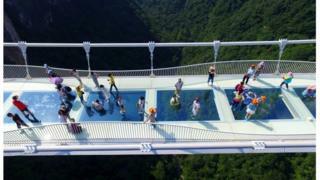 It hangs 300m over a canyon said to have inspired the landscapes of the film Avatar. When it opened, it was said to be the highest and longest glass-bottomed bridge in the world. The bridge can accommodate 8,000 visitors a day but the spokesman told CNN that 10 times as many people wanted access daily. Officials at the park announced the closure in a post on the Chinese micro-blogging site, Weibo. They did not mention visitor numbers but said the government urgently needed to upgrade the area. The post said that tour groups who had planned to see the bridge over the weekend might have "discretionary admission". In response to the announcement, one social media user wrote: "I have booked everything and now you are saying you are closed... Are you kidding me?"